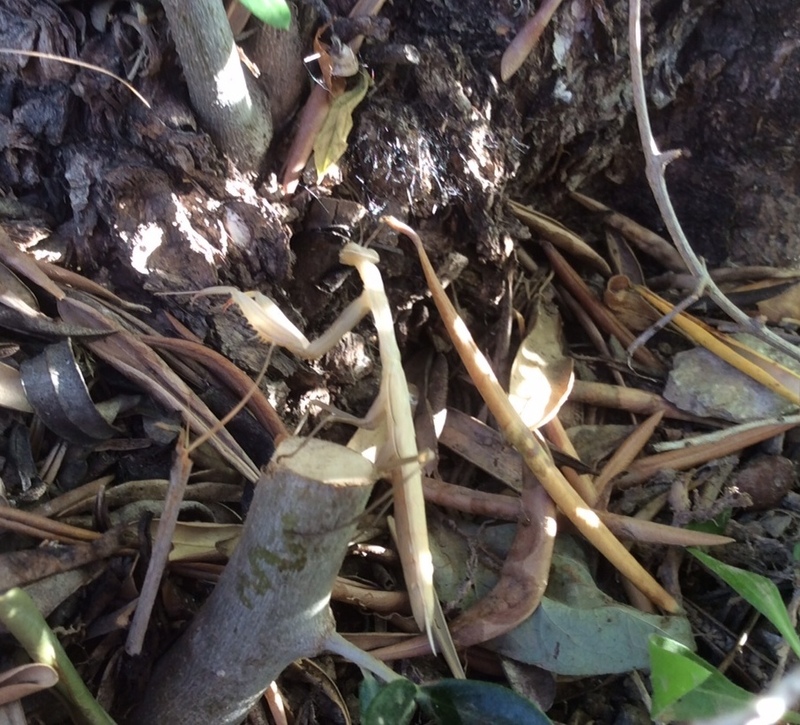 While S was digging in the dirt she spotted a 5cm-long albino mantis. They change colour to camouflage themselves and this one was among white geraniums. As we carefully approached, untangling olive branches from our hair, the mantis extended its forelegs in readiness to, presumably, strike. Here’s some excellent information about them on Wikipedia. Apparently, the common spelling with an ‘a’ – praying mantis – refers to only a single species, (mantis religiosa) which this one may quite well be. Note how it merges with its surroundings brilliantly – a close leaf relative nearby? I’ve never seen an albino mantid, either. Awwwwww …. I wonder how they get on when they want to find a mate? Do they get shunned? If I’m not mistaken, they are the only insects that can turn their heads in the way that they do. You two are turning into Gerald Durrell. Love it. The ones I have seen are usually bright green and they seem very aware of you, swiveling that strange triangular head to look at you! Yes, think they are normally green. Exquisite little things.